If you are feeling stressed with the waste in your residential or commercial property in Epping, your best option is to get in touch with Away With It. You do not need to worry about permit issues and problems with space, our experts will handle all of that for you and make your skip hire experience easy. With our head office located just down the road in Loughton, we are perfectly situated to help with skip hire and waste removal in Epping and have been doing so for over fifteen years. We are a local service, providing high-quality customer engagement and cost-effective waste solutions. 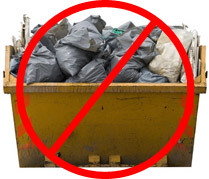 For some clients, skip hire is the perfect choice of waste removal. It allows them to fill up their container with whatever they choose, at a leisurely pace. However, we offer an alternative to our traditional skip hire service. 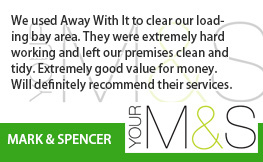 Whether you are wanting to get rid of one item, or an entire properties’ worth of clutter, one of our two-man waste removals teams may be the cost-effective solution you are looking for. 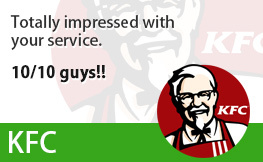 With this service you will not need to lift a finger; simply let our friendly team do the hard graft for you. They will efficiently load up their waste removals van as many times as needed and take it away there and then. This eliminates the time it takes for a skip to be picked up and you only pay for the final volume of waste collected. When you call us we’ll discuss the options open to you, so you can make an informed decision about the best possible solution for your situation. 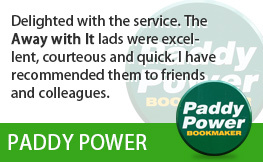 We understand that you are busy and we will always arrange a time and date that is best for you. Once you are happy with your service and quote we will provide you with a guaranteed two-hour time slot for the arrival of your skip or two-man waste team. 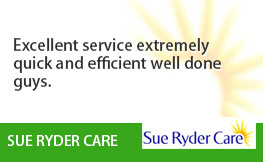 To give you peace of mind, we will give you a call when we are on our way to you. What’s more we’re able to arrange early morning, evening or weekend pick-ups, and often within a matter of days as we are open seven days a week, between 7am and 11:30pm. Depending on work load we may even be able to collect today! Furthermore, when we arrive, we won’t just dump a skip on your doorstep and leave. 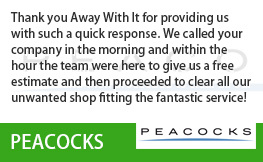 We are renowned for our customer service and we will be there to ensure you are happy with the service throughout. If you are having any problems, we are only a phone call away, and we can be on the road and ready to lend a hand! 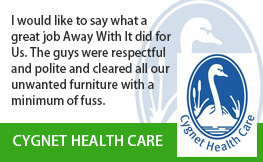 We genuinely care about our customers at Away With It. Once you have given our office a call, an expert will pop round to assess the job you need doing and give you a no-obligation quote for both skip hire and waste removal, if you would like. Once you are happy with the quote we can get the ball rolling with the waste removal options you have settled upon. The choice is yours! 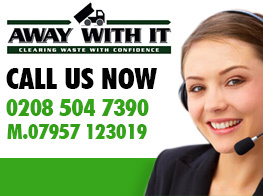 Whether you’re looking for waste removal or skip hire in Epping, why not give our friendly team a call today. The sooner you ring, the sooner you’ll be rid of that rubbish.